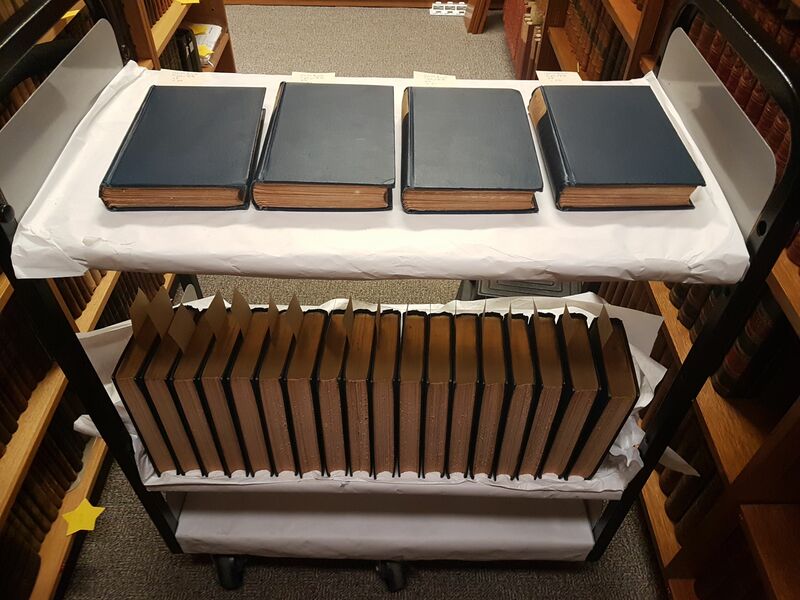 A team of four conservators from the Grimwade Centre for Cultural Materials Conservation recently completed comprehensive cleaning of the English Rare Book Collection at the Baillieu Library. 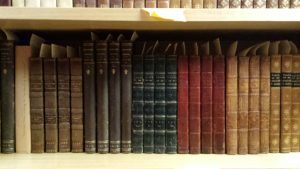 The collection comprises around 8,600 works from an array of 18th and 19th century British authors, including 2,500 volumes by Sir Walter Scott. While much of this collection is in excellent condition, collection maintenance and regular cleaning is essential to ensure it remains that way. Over time, dust and dirt build up on the cover, spine and textblock of a book, as well as on the surrounding shelves. Recent graduates of the Master of Cultural Materials Conservation program: Adele Barbara, Lois Waters, Mar Cruz and PhD candidate Sadra Zekrgoo, set to work on the cleaning process. 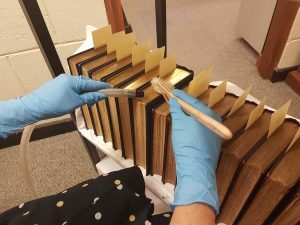 To clean this collection, each book was removed from the shelf, and the text block vacuumed with a HEPA filter vacuum, using a soft brush to loosen dust and dirt. To clean the leather or cloth covers, each book was gently wiped down with a microfibre cloth. 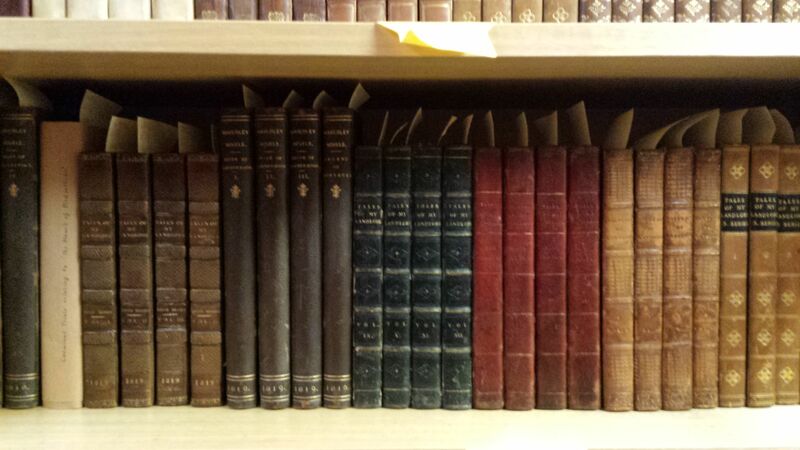 Each shelf was also wiped down with a separate microfibre cloth, before every book was returned to its place. This method ensured that any dirt or dust could be removed without disturbing any elaborate gold tooling, or reducing the colour of the fine leather bindings. 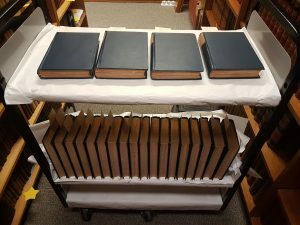 A HEPA filter vacuum and a soft hake brush were used to loosen dust and dirt from the head and fore-edge of each book. During this cleaning process, the conservation team also took the opportunity to conduct a comprehensive survey of the condition of the collection as a whole. Collection surveys allow staff to gain a comprehensive understanding of the health of a collection overall, and identify individual items that may need further attention. Throughout the cleaning project, books showing signs of wear and tear and their associated fragments were placed into individual bags made of polyethylene, an inert archival plastic. The most common type of degradation found throughout the collection was the powdering and flaking of the leather bindings, known as red rot. Detached covers and cracking at the head and tail of the spine were also common. Degraded volumes were also recorded in a collection assessment spreadsheet along with their condition details. This ensures that Collections staff can easily locate these objects, and formulate a plan for their future care and conservation. Cleaned collection items ready to return to the shelf. The English Rare Book collection cleaning project was not just an essential part of collection maintenance and care, but also provided an opportunity to understand the condition of the collection and to the collection’s future needs.